This article is about the concept in the physical sciences. For other uses, see Matter (disambiguation). Usually atoms can be imagined as a nucleus of protons and neutrons, and a surrounding "cloud" of orbiting electrons which "take up space". However this is only somewhat correct, because subatomic particles and their properties are governed by their quantum nature, which means they do not act as everyday objects appear to act – they can act like waves as well as particles and they do not have well-defined sizes or positions. In the Standard Model of particle physics, matter is not a fundamental concept because the elementary constituents of atoms are quantum entities which do not have an inherent "size" or "volume" in any everyday sense of the word. Due to the exclusion principle and other fundamental interactions, some "point particles" known as fermions (quarks, leptons), and many composites and atoms, are effectively forced to keep a distance from other particles under everyday conditions; this creates the property of matter which appears to us as matter taking up space. Matter should not be confused with mass, as the two are not the same in modern physics. Matter is a general term describing any 'physical substance'. By contrast, mass is not a substance but rather a quantitative property of matter and other substances or systems; various types of mass are defined within physics – including but not limited to rest mass, inertial mass, relativistic mass, mass–energy. A definition of "matter" based on its physical and chemical structure is: matter is made up of atoms . Such atomic matter is also sometimes termed ordinary matter. As an example, deoxyribonucleic acid molecules (DNA) are matter under this definition because they are made of atoms. This definition can be extended to include charged atoms and molecules, so as to include plasmas (gases of ions) and electrolytes (ionic solutions), which are not obviously included in the atoms definition. Alternatively, one can adopt the protons, neutrons, and electrons definition. A definition of "matter" more fine-scale than the atoms and molecules definition is: matter is made up of what atoms and molecules are made of, meaning anything made of positively charged protons, neutral neutrons, and negatively charged electrons. This definition goes beyond atoms and molecules, however, to include substances made from these building blocks that are not simply atoms or molecules, for example electron beams in an old cathode ray tube television, or white dwarf matter—typically, carbon and oxygen nuclei in a sea of degenerate electrons. At a microscopic level, the constituent "particles" of matter such as protons, neutrons, and electrons obey the laws of quantum mechanics and exhibit wave–particle duality. At an even deeper level, protons and neutrons are made up of quarks and the force fields (gluons) that bind them together, leading to the next definition. As seen in the above discussion, many early definitions of what can be called "ordinary matter" were based upon its structure or "building blocks". On the scale of elementary particles, a definition that follows this tradition can be stated as: "ordinary matter is everything that is composed of quarks and leptons", or "ordinary matter is everything that is composed of any elementary fermions except antiquarks and antileptons". The connection between these formulations follows. This definition of ordinary matter is more subtle than it first appears. All the particles that make up ordinary matter (leptons and quarks) are elementary fermions, while all the force carriers are elementary bosons. The W and Z bosons that mediate the weak force are not made of quarks or leptons, and so are not ordinary matter, even if they have mass. In other words, mass is not something that is exclusive to ordinary matter. The quark–lepton definition of ordinary matter, however, identifies not only the elementary building blocks of matter, but also includes composites made from the constituents (atoms and molecules, for example). Such composites contain an interaction energy that holds the constituents together, and may constitute the bulk of the mass of the composite. As an example, to a great extent, the mass of an atom is simply the sum of the masses of its constituent protons, neutrons and electrons. However, digging deeper, the protons and neutrons are made up of quarks bound together by gluon fields (see dynamics of quantum chromodynamics) and these gluons fields contribute significantly to the mass of hadrons. In other words, most of what composes the "mass" of ordinary matter is due to the binding energy of quarks within protons and neutrons. For example, the sum of the mass of the three quarks in a nucleon is approximately 7001125000000000000♠12.5 MeV/c2 , which is low compared to the mass of a nucleon (approximately 7002938000000000000♠938 MeV/c2 ). The bottom line is that most of the mass of everyday objects comes from the interaction energy of its elementary components. A common or traditional definition of matter is "anything that has mass and volume (occupies space)". For example, a car would be said to be made of matter, as it has mass and volume (occupies space). The observation that matter occupies space goes back to antiquity. However, an explanation for why matter occupies space is recent, and is argued to be a result of the phenomenon described in the Pauli exclusion principle,   which applies to fermions. Two particular examples where the exclusion principle clearly relates matter to the occupation of space are white dwarf stars and neutron stars, discussed further below. In the context of relativity, mass is not an additive quantity, in the sense that one can not add the rest masses of particles in a system to get the total rest mass of the system. Thus, in relativity usually a more general view is that it is not the sum of rest masses, but the energy–momentum tensor that quantifies the amount of matter. This tensor gives the rest mass for the entire system. "Matter" therefore is sometimes considered as anything that contributes to the energy–momentum of a system, that is, anything that is not purely gravity. This view is commonly held in fields that deal with general relativity such as cosmology. In this view, light and other massless particles and fields are all part of "matter". Hadronic matter can refer to 'ordinary' baryonic matter, made from hadrons (Baryons and mesons), or quark matter (a generalisation of atomic nuclei), ie. the 'low' temperature QCD matter. It includes degenerate matter and the result of high energy heavy nuclei collisions. Distinct from dark matter. In physics, degenerate matter refers to the ground state of a gas of fermions at a temperature near absolute zero. The Pauli exclusion principle requires that only two fermions can occupy a quantum state, one spin-up and the other spin-down. Hence, at zero temperature, the fermions fill up sufficient levels to accommodate all the available fermions—and in the case of many fermions, the maximum kinetic energy (called the Fermi energy ) and the pressure of the gas becomes very large, and depends on the number of fermions rather than the temperature, unlike normal states of matter. The narrower meaning is quark matter that is more stable than nuclear matter. The idea that this could happen is the "strange matter hypothesis" of Bodmer  and Witten. In this definition, the critical pressure is zero: the true ground state of matter is always quark matter. The nuclei that we see in the matter around us, which are droplets of nuclear matter, are actually metastable, and given enough time (or the right external stimulus) would decay into droplets of strange matter, i.e. strangelets. In bulk, matter can exist in several different forms, or states of aggregation, known as phases ,  depending on ambient pressure, temperature and volume. A phase is a form of matter that has a relatively uniform chemical composition and physical properties (such as density, specific heat, refractive index, and so forth). These phases include the three familiar ones (solids, liquids, and gases), as well as more exotic states of matter (such as plasmas, superfluids, supersolids, Bose–Einstein condensates, ...). 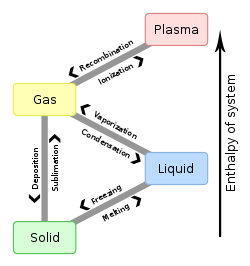 A fluid may be a liquid, gas or plasma. There are also paramagnetic and ferromagnetic phases of magnetic materials. As conditions change, matter may change from one phase into another. These phenomena are called phase transitions, and are studied in the field of thermodynamics. In nanomaterials, the vastly increased ratio of surface area to volume results in matter that can exhibit properties entirely different from those of bulk material, and not well described by any bulk phase (see nanomaterials for more details). In particle physics and quantum chemistry, antimatter is matter that is composed of the antiparticles of those that constitute ordinary matter. If a particle and its antiparticle come into contact with each other, the two annihilate; that is, they may both be converted into other particles with equal energy in accordance with Einstein's equation E = mc2 . These new particles may be high-energy photons (gamma rays) or other particle–antiparticle pairs. The resulting particles are endowed with an amount of kinetic energy equal to the difference between the rest mass of the products of the annihilation and the rest mass of the original particle–antiparticle pair, which is often quite large. Depending on which definition of "matter" is adopted, antimatter can be said to be a particular subclass of matter, or the opposite of matter. There is considerable speculation both in science and science fiction as to why the observable universe is apparently almost entirely matter (in the sense of quarks and leptons but not antiquarks or antileptons), and whether other places are almost entirely antimatter (antiquarks and antileptons) instead. In the early universe, it is thought that matter and antimatter were equally represented, and the disappearance of antimatter requires an asymmetry in physical laws called CP (charge-parity) symmetry violation, which can be obtained from the Standard Model,  but at this time the apparent asymmetry of matter and antimatter in the visible universe is one of the great unsolved problems in physics. Possible processes by which it came about are explored in more detail under baryogenesis. Formally, antimatter particles can be defined by their negative baryon number or lepton number, while "normal" (non-antimatter) matter particles have positive baryon or lepton number. These two classes of particles are the antiparticle partners of one another. In October 2017, scientists reported further evidence that matter and antimatter, equally produced at the Big Bang, are identical, should completely annihilate each other and, as a result, the universe should not exist. This implies that there must be something, as yet unknown to scientists, that either stopped the complete mutual destruction of matter and antimatter in the early forming universe, or that gave rise to an imbalance between the two forms. Two quantities that can define an amount of matter in the quark–lepton sense (and antimatter in an antiquark–antilepton sense), baryon number and lepton number, are conserved in the Standard Model. A baryon such as the proton or neutron has a baryon number of one, and a quark, because there are three in a baryon, is given a baryon number of 1/3. So the net amount of matter, as measured by the number of quarks (minus the number of antiquarks, which each have a baryon number of −1/3), which is proportional to baryon number, and number of leptons (minus antileptons), which is called the lepton number, is practically impossible to change in any process. Even in a nuclear bomb, none of the baryons (protons and neutrons of which the atomic nuclei are composed) are destroyed—there are as many baryons after as before the reaction, so none of these matter particles are actually destroyed and none are even converted to non-matter particles (like photons of light or radiation). Instead, nuclear (and perhaps chromodynamic) binding energy is released, as these baryons become bound into mid-size nuclei having less energy (and, equivalently, less mass) per nucleon compared to the original small (hydrogen) and large (plutonium etc.) nuclei. Even in electron–positron annihilation, there is no net matter being destroyed, because there was zero net matter (zero total lepton number and baryon number) to begin with before the annihilation—one lepton minus one antilepton equals zero net lepton number—and this net amount matter does not change as it simply remains zero after the annihilation. So the only way to really "destroy" or "convert" ordinary matter is to pair it with the same amount of antimatter so that their "matterness" cancels out—but in practice there is almost no antimatter generally available in the universe (see baryon asymmetry and leptogenesis) with which to do so. Aristotle (384–322 BC) was the first to put the conception on a sound philosophical basis, which he did in his natural philosophy, especially in Physics book I. He adopted as reasonable suppositions the four Empedoclean elements, but added a fifth, aether. Nevertheless, these elements are not basic in Aristotle's mind. Rather they, like everything else in the visible world, are composed of the basic principles matter and form. The word Aristotle uses for matter, ὕλη (hyle or hule), can be literally translated as wood or timber, that is, "raw material" for building. Indeed, Aristotle's conception of matter is intrinsically linked to something being made or composed. In other words, in contrast to the early modern conception of matter as simply occupying space, matter for Aristotle is definitionally linked to process or change: matter is what underlies a change of substance. For example, a horse eats grass: the horse changes the grass into itself; the grass as such does not persist in the horse, but some aspect of it—its matter—does. The matter is not specifically described (e.g., as atoms), but consists of whatever persists in the change of substance from grass to horse. Matter in this understanding does not exist independently (i.e., as a substance), but exists interdependently (i.e., as a "principle") with form and only insofar as it underlies change. It can be helpful to conceive of the relationship of matter and form as very similar to that between parts and whole. For Aristotle, matter as such can only receive actuality from form; it has no activity or actuality in itself, similar to the way that parts as such only have their existence in a whole (otherwise they would be independent wholes). For Descartes, matter has only the property of extension, so its only activity aside from locomotion is to exclude other bodies:  this is the mechanical philosophy. Descartes makes an absolute distinction between mind, which he defines as unextended, thinking substance, and matter, which he defines as unthinking, extended substance. They are independent things. In contrast, Aristotle defines matter and the formal/forming principle as complementary principles that together compose one independent thing (substance). In short, Aristotle defines matter (roughly speaking) as what things are actually made of (with a potential independent existence), but Descartes elevates matter to an actual independent thing in itself. Aspects of the Newtonian view still held sway. James Clerk Maxwell discussed matter in his work Matter and Motion. He carefully separates "matter" from space and time, and defines it in terms of the object referred to in Newton's first law of motion. The modern conception of matter has been refined many times in history, in light of the improvement in knowledge of just what the basic building blocks are, and in how they interact. The term "matter" is used throughout physics in a bewildering variety of contexts: for example, one refers to "condensed matter physics",  "elementary matter",  "partonic" matter, "dark" matter, "anti"-matter, "strange" matter, and "nuclear" matter. In discussions of matter and antimatter, normal matter has been referred to by Alfvén as koinomatter (Gk. common matter). It is fair to say that in physics, there is no broad consensus as to a general definition of matter, and the term "matter" usually is used in conjunction with a specifying modifier. 1 2 3 R. Penrose (1991). "The mass of the classical vacuum". In S. Saunders; H.R. Brown. The Philosophy of Vacuum. Oxford University Press. p. 21. ISBN 978-0-19-824449-3. ↑ "Matter (physics)". McGraw-Hill's Access Science: Encyclopedia of Science and Technology Online. Archived from the original on 17 June 2011. Retrieved 24 May 2009. ↑ "RHIC Scientists Serve Up "Perfect" Liquid" (Press release). Brookhaven National Laboratory. 18 April 2005. Retrieved 2009-09-15. ↑ P. Davies (1992). The New Physics: A Synthesis. Cambridge University Press. p. 1. ISBN 978-0-521-43831-5. ↑ Gerard't Hooft (1997). In search of the ultimate building blocks. Cambridge University Press. p. 6. ISBN 978-0-521-57883-7. ↑ J. Olmsted; G.M. Williams (1996). Chemistry: The Molecular Science (2nd ed.). Jones & Bartlett. p. 40. ISBN 978-0-8151-8450-8. ↑ J. Mongillo (2007). Nanotechnology 101. Greenwood Publishing. p. 30. ISBN 978-0-313-33880-9. 1 2 P.C.W. Davies (1979). The Forces of Nature. Cambridge University Press. p. 116. ISBN 978-0-521-22523-6. 1 2 S. Weinberg (1998). The Quantum Theory of Fields. Cambridge University Press. p. 2. ISBN 978-0-521-55002-4. ↑ M. Masujima (2008). Path Integral Quantization and Stochastic Quantization. Springer. p. 103. ISBN 978-3-540-87850-6. ↑ G.F. Barker (1870). "Divisions of matter". A text-book of elementary chemistry: theoretical and inorganic. John F Morton & Co. p. 2. ISBN 978-1-4460-2206-1. ↑ M. de Podesta (2002). Understanding the Properties of Matter (2nd ed.). CRC Press. p. 8. ISBN 978-0-415-25788-6. ↑ B. Povh; K. Rith; C. Scholz; F. Zetsche; M. Lavelle (2004). "Part I: Analysis: The building blocks of matter". Particles and Nuclei: An Introduction to the Physical Concepts (4th ed.). Springer. ISBN 978-3-540-20168-7. Ordinary matter is composed entirely of first-generation particles, namely the u and d quarks, plus the electron andits neutrino. 1 2 B. Carithers; P. Grannis (1995). "Discovery of the Top Quark" (PDF). Beam Line . 25 (3): 4–16. ↑ Tsan, Ung Chan (2006). "What Is a Matter Particle?". International Journal of Modern Physics E. 15 (1): 259–272. Bibcode:2006IJMPE..15..259C. doi:10.1142/S0218301306003916. (From Abstract:) Positive baryon numbers (A>0) and positive lepton numbers (L>0) characterize matter particles while negative baryon numbers and negative lepton numbers characterize antimatter particles. Matter particles and antimatter particles belong to two distinct classes of particles. Matter neutral particles are particles characterized by both zero baryon number and zero lepton number. 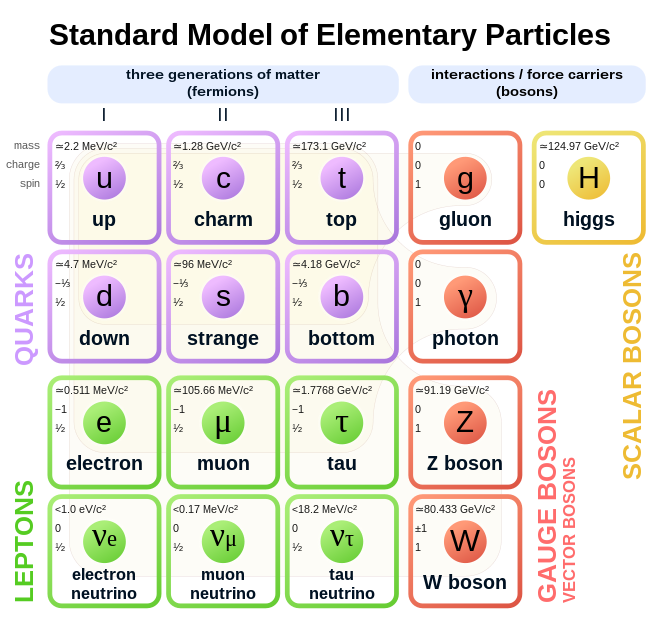 This third class of particles includes mesons formed by a quark and an antiquark pair (a pair of matter particle and antimatter particle) and bosons which are messengers of known interactions (photons for electromagnetism, W and Z bosons for the weak interaction, gluons for the strong interaction). The antiparticle of a matter particle belongs to the class of antimatter particles, the antiparticle of an antimatter particle belongs to the class of matter particles. ↑ D. Green (2005). High PT physics at hadron colliders. Cambridge University Press. p. 23. ISBN 978-0-521-83509-1. ↑ L. Smolin (2007). The Trouble with Physics: The Rise of String Theory, the Fall of a Science, and What Comes Next. Mariner Books. p. 67. ISBN 978-0-618-91868-3. ↑ The W boson mass is 80.398 GeV; see Figure 1 in C. Amsler; et al. (Particle Data Group) (2008). "Review of Particle Physics: The Mass and Width of the W Boson" (PDF). Physics Letters B . 667 (1): 1. Bibcode:2008PhLB..667....1A. doi:10.1016/j.physletb.2008.07.018. ↑ I.J.R. Aitchison; A.J.G. Hey (2004). Gauge Theories in Particle Physics. CRC Press. p. 48. ISBN 978-0-7503-0864-9. ↑ B. Povh; K. Rith; C. Scholz; F. Zetsche; M. Lavelle (2004). Particles and Nuclei: An Introduction to the Physical Concepts. Springer. p. 103. ISBN 978-3-540-20168-7. ↑ A.M. Green (2004). Hadronic Physics from Lattice QCD. World Scientific. p. 120. ISBN 978-981-256-022-3. ↑ T. Hatsuda (2008). "Quark–gluon plasma and QCD". In H. Akai. Condensed matter theories. 21. Nova Publishers. p. 296. ISBN 978-1-60021-501-8. ↑ K.W. Staley (2004). "Origins of the Third Generation of Matter". The Evidence for the Top Quark. Cambridge University Press. p. 8. ISBN 978-0-521-82710-2. ↑ S.M. Walker; A. King (2005). What is Matter?. Lerner Publications. p. 7. ISBN 978-0-8225-5131-7. ↑ J.Kenkel; P.B. Kelter; D.S. Hage (2000). Chemistry: An Industry-based Introduction with CD-ROM. CRC Press. p. 2. ISBN 978-1-56670-303-1. All basic science textbooks define matter as simply the collective aggregate of all material substances that occupy space and have mass or weight. ↑ K.A. Peacock (2008). The Quantum Revolution: A Historical Perspective. Greenwood Publishing Group. p. 47. ISBN 978-0-313-33448-1. ↑ M.H. Krieger (1998). Constitutions of Matter: Mathematically Modeling the Most Everyday of Physical Phenomena. University of Chicago Press. p. 22. ISBN 978-0-226-45305-7. ↑ S.M. Caroll (2004). Spacetime and Geometry. Addison Wesley. pp. 163–164. ISBN 978-0-8053-8732-2. ↑ P. Davies (1992). The New Physics: A Synthesis. Cambridge University Press. p. 499. ISBN 978-0-521-43831-5. Matter fields: the fields whose quanta describe the elementary particles that make up the material content of the Universe (as opposed to the gravitons and their supersymmetric partners). ↑ C. Amsler; et al. (Particle Data Group) (2008). "Reviews of Particle Physics: Quarks" (PDF). Physics Letters B . 667 (1–5): 1. Bibcode:2008PhLB..667....1A. doi:10.1016/j.physletb.2008.07.018. ↑ "Dark Energy Dark Matter". NASA Science: Astrophysics. 5 June 2015. ↑ Persic, Massimo; Salucci, Paolo (1992-09-01). "The baryon content of the Universe". Monthly Notices of the Royal Astronomical Society. 258 (1): 14P–18P. arXiv: astro-ph/0502178 . Bibcode:1992MNRAS.258P..14P. doi:10.1093/mnras/258.1.14P. ISSN 0035-8711. ↑ H.S. Goldberg; M.D. Scadron (1987). Physics of Stellar Evolution and Cosmology. Taylor & Francis. p. 202. ISBN 978-0-677-05540-4. ↑ H.S. Goldberg; M.D. Scadron (1987). Physics of Stellar Evolution and Cosmology. Taylor & Francis. p. 233. ISBN 978-0-677-05540-4. ↑ J.-P. Luminet; A. Bullough; A. King (1992). Black Holes. Cambridge University Press. p. 75. ISBN 978-0-521-40906-3. ↑ A. Bodmer (1971). "Collapsed Nuclei". Physical Review D . 4 (6): 1601. Bibcode:1971PhRvD...4.1601B. doi:10.1103/PhysRevD.4.1601. ↑ E. Witten (1984). "Cosmic Separation of Phases". Physical Review D . 30 (2): 272. Bibcode:1984PhRvD..30..272W. doi:10.1103/PhysRevD.30.272. ↑ C. Amsler; et al. (Particle Data Group) (2008). "Review of Particle Physics: Leptons" (PDF). Physics Letters B . 667 (1–5): 1. Bibcode:2008PhLB..667....1A. doi:10.1016/j.physletb.2008.07.018. ↑ C. Amsler; et al. (Particle Data Group) (2008). "Review of Particle Physics: Neutrinos Properties" (PDF). Physics Letters B . 667 (1–5): 1. Bibcode:2008PhLB..667....1A. doi:10.1016/j.physletb.2008.07.018. ↑ S.R. Logan (1998). Physical Chemistry for the Biomedical Sciences. CRC Press. pp. 110–111. ISBN 978-0-7484-0710-1. ↑ P.J. Collings (2002). "Chapter 1: States of Matter". Liquid Crystals: Nature's Delicate Phase of Matter. Princeton University Press. ISBN 978-0-691-08672-9. ↑ D.H. Trevena (1975). "Chapter 1.2: Changes of phase". The Liquid Phase. Taylor & Francis. ISBN 978-0-85109-031-3. ↑ National Research Council (US) (2006). Revealing the hidden nature of space and time. National Academies Press. p. 46. ISBN 978-0-309-10194-3. ↑ Adamson, Allan (19 October 2017). "Universe Should Not Actually Exist: Big Bang Produced Equal Amounts Of Matter And Antimatter". TechTimes.com. Retrieved 26 October 2017. ↑ Smorra C.; et al. (20 October 2017). "A parts-per-billion measurement of the antiproton magnetic moment". Nature. 550 (7676): 371–374. Bibcode:2017Natur.550..371S. doi:10.1038/nature24048. PMID 29052625 . Retrieved 26 October 2017. ↑ J.P. Ostriker; P.J. Steinhardt (2003). "New Light on Dark Matter". Science. 300 (5627): 1909–13. arXiv: astro-ph/0306402 . Bibcode:2003Sci...300.1909O. doi:10.1126/science.1085976. PMID 12817140. ↑ K. Pretzl (2004). "Dark Matter, Massive Neutrinos and Susy Particles". Structure and Dynamics of Elementary Matter. Walter Greiner. p. 289. ISBN 978-1-4020-2446-7. ↑ K. Freeman; G. McNamara (2006). "What can the matter be?". In Search of Dark Matter. Birkhäuser Verlag. p. 105. ISBN 978-0-387-27616-8. ↑ J.C. Wheeler (2007). Cosmic Catastrophes: Exploding Stars, Black Holes, and Mapping the Universe. Cambridge University Press. p. 282. ISBN 978-0-521-85714-7. ↑ J. Gribbin (2007). The Origins of the Future: Ten Questions for the Next Ten Years. Yale University Press. p. 151. ISBN 978-0-300-12596-2. ↑ P. Schneider (2006). Extragalactic Astronomy and Cosmology. Springer. p. 4, Fig. 1.4. ISBN 978-3-540-33174-2. ↑ T. Koupelis; K.F. Kuhn (2007). In Quest of the Universe. Jones & Bartlett Publishers. p. 492; Fig. 16.13. ISBN 978-0-7637-4387-1. ↑ M.H. Jones; R.J. Lambourne; D.J. Adams (2004). An Introduction to Galaxies and Cosmology. Cambridge University Press. p. 21; Fig. 1.13. ISBN 978-0-521-54623-2. 1 2 3 D. Majumdar (2007). Dark matter – possible candidates and direct detection. arXiv: hep-ph/0703310 . Bibcode:2008pahh.book..319M. ↑ K.A. Olive (2003). "Theoretical Advanced Study Institute lectures on dark matter". arXiv: astro-ph/0301505 . ↑ K.A. Olive (2009). "Colliders and Cosmology". European Physical Journal C . 59 (2): 269–295. arXiv: 0806.1208 . Bibcode:2009EPJC...59..269O. doi:10.1140/epjc/s10052-008-0738-8. ↑ J.C. Wheeler (2007). Cosmic Catastrophes. Cambridge University Press. p. 282. ISBN 978-0-521-85714-7. ↑ L. Smolin (2007). The Trouble with Physics. Mariner Books. p. 16. ISBN 978-0-618-91868-3. ↑ S. Toulmin; J. Goodfield (1962). The Architecture of Matter. University of Chicago Press. pp. 48–54. ↑ Discussed by Aristotle in Physics , esp. book I, but also later; as well as Metaphysics I–II. ↑ For a good explanation and elaboration, see R.J. Connell (1966). Matter and Becoming. Priory Press. ↑ H.G. Liddell; R. Scott; J.M. Whiton (1891). A lexicon abridged from Liddell & Scott's Greek–English lexicon. Harper and Brothers. p. 72. ↑ R. Descartes (1644). "The Principles of Human Knowledge". Principles of Philosophy I. p. 53. ↑ R. Descartes (1644). "The Principles of Human Knowledge". Principles of Philosophy I. pp. 8, 54, 63. ↑ D.L. Schindler (1986). "The Problem of Mechanism". In D.L. Schindler. Beyond Mechanism. University Press of America. ↑ E.A. Burtt, Metaphysical Foundations of Modern Science (Garden City, New York: Doubleday and Company, 1954), 117–118. ↑ J.E. McGuire and P.M. Heimann, "The Rejection of Newton's Concept of Matter in the Eighteenth Century", The Concept of Matter in Modern Philosophy ed. Ernan McMullin (Notre Dame: University of Notre Dame Press, 1978), 104–118 (105). ↑ Isaac Newton, Mathematical Principles of Natural Philosophy, trans. A. Motte, revised by F. Cajori (Berkeley: University of California Press, 1934), pp. 398–400. Further analyzed by Maurice A. Finocchiaro, "Newton's Third Rule of Philosophizing: A Role for Logic in Historiography", Isis 65:1 (Mar. 1974), pp. 66–73. 1 2 3 N. Chomsky (1988). Language and problems of knowledge: the Managua lectures (2nd ed.). MIT Press. p. 144. ISBN 978-0-262-53070-5. ↑ Nevertheless, it remains true that the mathematization regarded as requisite for a modern physical theory carries its own implicit notion of matter, which is very like Descartes', despite the demonstrated vacuity of the latter's notions. ↑ M. Wenham (2005). Understanding Primary Science: Ideas, Concepts and Explanations (2nd ed.). Paul Chapman Educational Publishing. p. 115. ISBN 978-1-4129-0163-5. ↑ J.C. Maxwell (1876). Matter and Motion. Society for Promoting Christian Knowledge. p. 18. ISBN 978-0-486-66895-6. ↑ T.H. Levere (1993). "Introduction". Affinity and Matter: Elements of Chemical Philosophy, 1800–1865. Taylor & Francis. ISBN 978-2-88124-583-1. ↑ G.F. Barker (1870). "Introduction". A Text Book of Elementary Chemistry: Theoretical and Inorganic. John P. Morton and Company. p. 2. ↑ J.J. Thomson (1909). "Preface". Electricity and Matter. A. Constable. ↑ O.W. Richardson (1914). "Chapter 1". The Electron Theory of Matter. The University Press. ↑ M. Jacob (1992). The Quark Structure of Matter. World Scientific. ISBN 978-981-02-3687-8. ↑ V. de Sabbata; M. Gasperini (1985). Introduction to Gravitation. World Scientific. p. 293. ISBN 978-9971-5-0049-8. ↑ The history of the concept of matter is a history of the fundamental length scales used to define matter. Different building blocks apply depending upon whether one defines matter on an atomic or elementary particle level. One may use a definition that matter is atoms, or that matter is hadrons, or that matter is leptons and quarks depending upon the scale at which one wishes to define matter. B. Povh; K. Rith; C. Scholz; F. Zetsche; M. Lavelle (2004). "Fundamental constituents of matter". Particles and Nuclei: An Introduction to the Physical Concepts (4th ed.). Springer. ISBN 978-3-540-20168-7. 1 2 J. Allday (2001). Quarks, Leptons and the Big Bang. CRC Press. p. 12. ISBN 978-0-7503-0806-9. ↑ B.A. Schumm (2004). Deep Down Things: The Breathtaking Beauty of Particle Physics. Johns Hopkins University Press. p. 57. ISBN 978-0-8018-7971-5. ↑ See for example, M. Jibu; K. Yasue (1995). Quantum Brain Dynamics and Consciousness. John Benjamins Publishing Company. p. 62. ISBN 978-1-55619-183-1. , B. Martin (2009). Nuclear and Particle Physics (2nd ed.). John Wiley & Sons. p. 125. ISBN 978-0-470-74275-4. and K.W. Plaxco; M. Gross (2006). Astrobiology: A Brief Introduction. Johns Hopkins University Press. p. 23. ISBN 978-0-8018-8367-5. ↑ P.A. Tipler; R.A. Llewellyn (2002). Modern Physics. Macmillan. pp. 89–91, 94–95. ISBN 978-0-7167-4345-3. ↑ P. Schmüser; H. Spitzer (2002). "Particles". In L. Bergmann; et al. Constituents of Matter: Atoms, Molecules, Nuclei. CRC Press. pp. 773&nbsp, ff. ISBN 978-0-8493-1202-1. ↑ P.M. Chaikin; T.C. Lubensky (2000). Principles of Condensed Matter Physics. Cambridge University Press. p. xvii. ISBN 978-0-521-79450-3. ↑ W. Greiner (2003). W. Greiner; M.G. Itkis; G. Reinhardt; M.C. Güçlü, eds. Structure and Dynamics of Elementary Matter. Springer. p. xii. ISBN 978-1-4020-2445-0. ↑ P. Sukys (1999). Lifting the Scientific Veil: Science Appreciation for the Nonscientist. Rowman & Littlefield. p. 87. ISBN 978-0-8476-9600-0. ↑ B. Povh; K. Rith; C. Scholz; F. Zetsche; M. Lavelle (2004). "Fundamental constituents of matter". Particles and Nuclei: An Introduction to the Physical Concepts (4th ed.). Springer. ISBN 978-3-540-20168-7. Wikimedia Commons has media related to Matter .